Sea ice extent and concentration in the Arctic and Antarctic are changing daily. Information on these parameters is gained from satellite observations and is presented here as daily maps of sea ice concentrations and time series of sea ice extent and area. An assessment of the current sea ice state in the Arctic and Antarctic can be found here (in German). The following figure shows the current sea ice extent (red). Sea ice extent defines a region as „ice-covered“ or „ice-free“. Based on a certain threshold value, each individual grid cell of the satellite measurements is grouped into one of the two categories. For this figure, the threshold value was set to 15 percent. 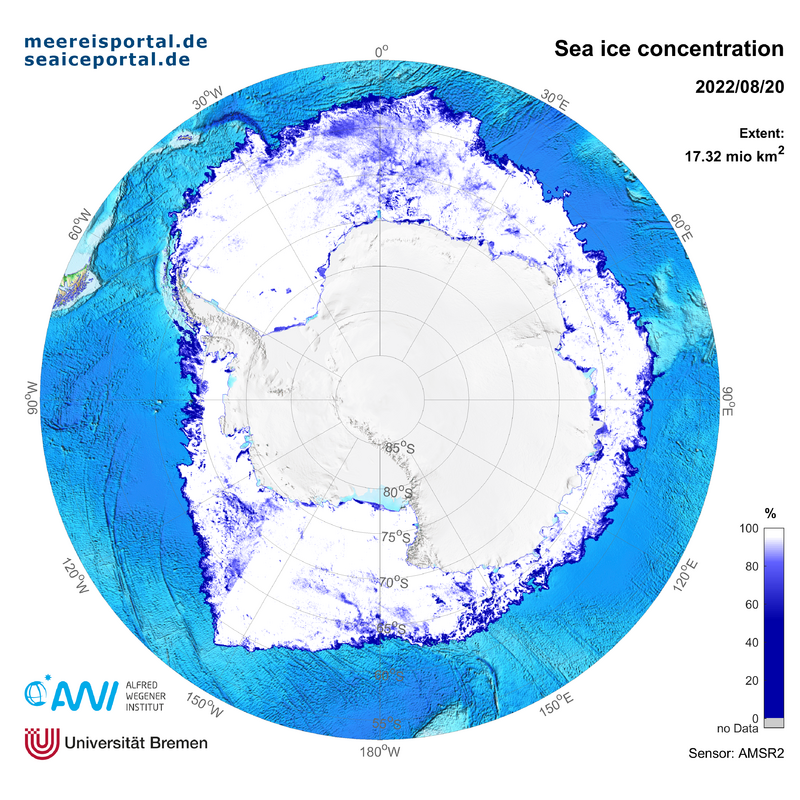 This means that if a grid cell exhibits a sea ice concentration above 15 percent, it is classified as „ice-covered“. If the concentration is below 15 percent, the cell is „ice-free“. Additionally, .kmz files for display in googleEarth are available for today's data and can be downloaded here for the Arctic and Antarctic.